My friends know that I love to dream. 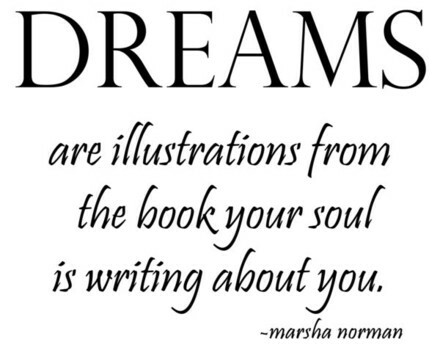 I’m not referring to daydreaming or coming up with big ideas, although I definitely like those types of dreams. I’m talking about the nightly entertainment I get every time I sleep. Sometimes my dreams are insightful. Sometimes they are enjoyable. And sometimes they are downright bizarre. Regardless of the message they are sending me or the opportunity to deal with both obvious and hidden emotions, I appreciate them. I’m always surprised when other people say they don’t dream. I can’t imagine not waking up without thinking about where my brain goes when I’m asleep. The journeys and adventures it takes me on are always reason to smile. Posted on April 24, 2014, in My life, perspective and tagged 365 reasons to smile, dreams, life, musings, sleep, smiles, Thoughts. Bookmark the permalink. 12 Comments.